Cochran INFINITI Gallery of South Hills is proud to serve drivers from Pittsburgh, Bethel Park and beyond with exceptional INFINITI sales, service and financing. Whether you’d like to lease a new INFINITI QX50, discuss your INFINITI financing options or stop by for reliable INFINITI service, you’ll find that we’re always ready to help. Our INFINITI dealer in Pittsburgh, PA, is dedicated to providing a VIP customer experience to ensure you enjoy a stress-free car-shopping experience time and time again. 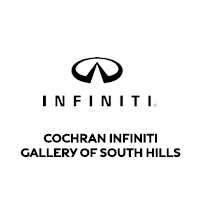 Cochran INFINITI Gallery of South Hills is the local INFINITI dealership you can trust! If you’re in the market for a new INFINITI, you’ll find everything you need at our Pennsylvania INFINITI dealership. Test-drive a new INFINITI Q50 sedan or a new QX60 crossover to experience the roads around Greater Pittsburgh like never before. When you finance a new INFINITI QX80, Q60 or any other model with us, you’re sure to go home happy. Those who are shopping on a budget will love our selection of used INFINITI models. With used cars for sale from a variety of makes, you’ll find your next like-new car in no time. Our INFINITI finance experts are standing by to help you lease the INFINITI of your dreams or get a competitive INFINITI financing offer when you’re ready. Turn to our Pittsburgh, PA, INFINITI service center when it’s time for INFINITI repairs and maintenance. Take advantage of INFINITI Express Service and our INFINITI service specials to save time and money on INFINITI maintenance like oil changes, multi-point inspections and wheel alignments. Our highly trained technicians are also here to help with INFINITI parts replacements. Cochran INFINITI Gallery of South Hills is conveniently located at 3220 West Liberty Avenue in Pittsburgh, PA, which is just a short drive for those coming from Peters Township and Mount Lebanon. Come to Cochran INFINITI Gallery of South Hills to Go One Better!